Since I know there will be some people here that can theorycraft their class quite well. Intellect (spell power for the power of our healing spells) -> Spirit (for Mana regen) -> Haste (8% cap for all ticks) -> Full Mastery -> crit. Well why I think that the first soft cap @ level 90 would be 8%.. That's quite simple.. Since I think, and I cannot confirm if it's true or not. When I try to calculate it. Item Level 463	Equip: Increases your haste rating by301 (0.71% @ L90). Well @ level 90 as you can see. 301 haste rating will be the same as 0.71%. @ Level 85 our soft haste cap was around 916 haste. (780 if you were a goblin with the 1% haste buff). So I tried to calculate it and I used 301 haste rating multiple times by 12. I would like to know what the other Theorycrafters would think about this..
After all I cannot confirm if it's true or not.. But It's a theory. Also forgot to mention this was for Restoration shaman. 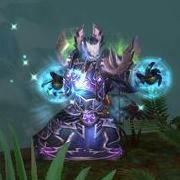 The main soft haste cap for Restoration Shamans was at 12.5% haste, where you would get an additional tick of Earthliving. This means 7.15% haste from your Haste Rating alone if you have the +5% spell haste raid buff. Since we want to go for some perfect world rank kills as guild.. So I rather want to start to early and keep myself fully updated then being to late ;). Edited: Putted a new line down. I just read on MMO Class Analysis that they will buff Healing Rain + decrease it's cost. And that they will improve the out put of Chain heal.